BEIRUT - The leader of Lebanon's militant Hezbollah group showed up at a Shiite religious ceremony in southern Beirut on Thursday, vowing to keep his fighters in neighboring Syria as long as needed to shore up President Bashar Assad's struggle against Syria's rebels. The public appearance of Hassan Nasrallah - his second in as many days - came as tens of thousands of Shiites and Hezbollah supporters marched in their southern Beirut stronghold for the Ashoura, one of the Shiite sect's most important religious occasions. "As long as there are reasons for us to stay in Syria, we will stay there," said the black-turbaned cleric, standing on an open-air podium, surrounded by several bodyguards. 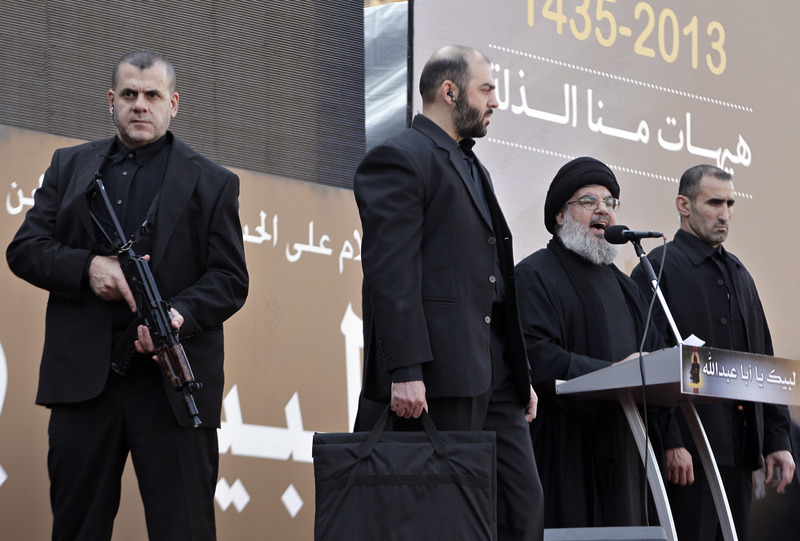 "At your service, Nasrallah," chanted thousands of followers, waving their fists in the air.
} Syria's civil war has pitted the mostly Sunni rebels against Assad's forces, dominated by his Alawite sect, a Shiite offshoot. Battle-hardened Hezbollah fighters openly joined the conflict earlier this year in a major boost to Assad and were instrumental in recent Syrian government victories, mostly in the suburbs of the Syrian capital of Damascus and in areas near the border with Lebanon. At the gathering in Beirut, Nasrallah told followers that Hezbollah's fighters will remain in Syria to "defend Lebanon, Palestine, the Palestinian question and Syria, the protector of the resistance." His comments will likely anger rival Lebanese politicians who have said that Hezbollah's withdrawal from Syria is a precondition for the organization joining a new government. Lebanon's prime minister-designate, Tammam Salam, has not been able to form a Cabinet since April as a result of political disagreement between rival groups - mostly over Syria's civil war, which has sharply divided the Lebanese. Lebanese security officials said at least seven rockets fired from Syria on Thursday fell in the eastern village of Nabi Sheet, a Hezbollah stronghold, but caused no casualties. Such attacks have been common since Hezbollah joined Assad's forces. Also Thursday, Syrian army helicopters fired several rockets on an area along Lebanon's border near the eastern town of Arsal, said the Lebanese officials, who spoke on condition of anonymity in line with regulations. It was not clear if the fire caused any casualties or if the missiles struck inside Lebanon. The massive Hezbollah ceremony in Beirut was held amid tight security, including a ban on vehicles in the area, following huge bombings last summer that killed and wounded dozens of people. Ashoura commemorates the 7th-century death of Imam Hussein, the Prophet Muhammad's grandson, and is a major annual event for Shiite Muslims, marked by somber and mournful marches and processions. Nasrallah, who lives in hiding, has made few public appearances since his group fought a 34-day war with Israel in 2006 for fear of assassination by Israel. Thursday was his third public appearance this year.